There are nightdives, you wish they could last two hours! For example in Lembeh, where nightdives can be absolutely spectacular! We saw a stargazer, a stonefish, some devilfishes, and a velvetfish (a rarity!) many nudibranchs and two tiny cuttlefish that were hiding between the needles of a sea urchin. 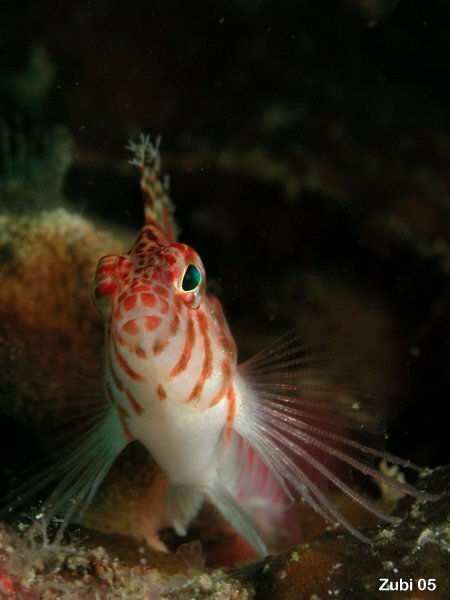 This beautiful little hawkfish with its filigree tufts (or cirri) on the tips of its dorsal fins was hiding during the night. Hawkfishes are usually very shy. 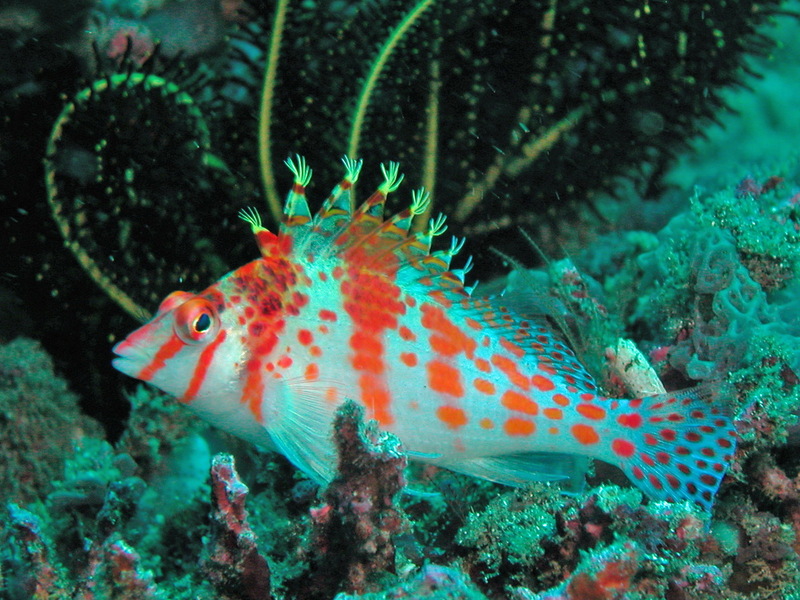 During the day they perch on on the edge of coral heads and disappear quickly if divers come near. Es gibt Nachttauchgänge, wo man sich wünscht, dass man 2 Stunden unten bleiben könnte! Zum Beispiel in Lembeh - hier ist es echt spektakulär! Wir sahen Himmelsgucker, Steinfische, Teufelsfische, Samtfisch (sehr selten) und viele Nacktschnecken. Zwischen den Nadeln eines Seeigels entdeckten wir sogar zwei winzige Sepias.